The icicles hanging from your roof may signal a problem. Icicles can be a sign of ice dams – chunks of ice that form along the edges of your roof. When a home experiences ice dams, it’s often assumed the issue is inadequate insulation. 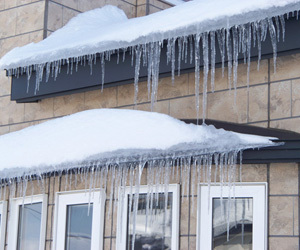 Ice dams may be caused by heat loss in an attic, poor roof design or the “perfect storm” of snow, melting and more snow. Preventing ice dams is a three-pronged attack consisting of air sealing, ventilation and insulation. Approximately 60% of heat loss in a home is through the ceiling into the attic, primarily through air leaks. Sealing air leaks around penetration points like light fixtures, plumbing pipes, chimneys and access hatches can help minimize ice dams. Air sealing can also help keep warm air inside your home and reduce heating bills. Proper ventilation is an important part of attic insulation. Attic ventilation helps facilitate proper airflow through the attic space. This allows the entire attic system to work properly, preventing moisture build-up and allowing the insulation to properly do its job. Properly insulating your attic space will help keep heat where it belongs – in your living space. If your attic has inadequate insulation, blown-in fiberglass insulation can be added on top of existing insulation to create a complete thermal blanket. We work to help prevent ice dams, not remove them. If you get one, for your own safety be sure to have a professional remove it. To learn more about ice dams, watch the video below. Contact our office to schedule your free estimate.